REDmoney Seminars present a fully updated two-day program to provide a comprehensive understanding and update on Shariah compliant legal documentation for various forms of Islamic financial transactions. 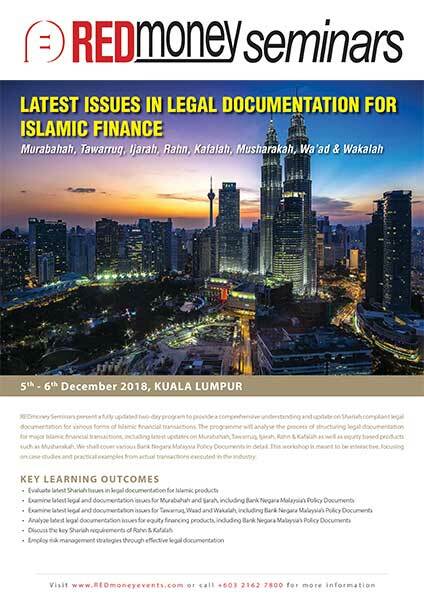 The programme will analyse the process of structuring legal documentation for major Islamic financial transactions, including latest updates on Murabahah, Tawarruq, Ijarah, Rahn & Kafalah as well as equity based products such as Musharakah. We shall cover various Bank Negara Malaysia Policy Documents in detail. This workshop is meant to be interactive, focusing on case studies and practical examples from actual transactions executed in the industry. Johan is the senior partner of J. Lee & Associates, a medium-size award-winning legal firm in Malaysia. The firm is now a member of Primerus law, an international legal chambers group. Primerus law is one of the top three biggest legal firm groups in the world. Johan is a leading Shariah advisor of JLA Shariah Consultancy. Johan graduated with LLB (Hons) degree from International Islamic University Malaysia. He holds a Master of Comparative Laws degree, a post-graduate Diploma in Shariah and Legal Practice from International Islamic University Malaysia, an MA in Economics for Competition Law from King’s Collage London and a PhD in Business and Commercial Law from Monash University Australia. He is a qualified member of the Chartered Institute of Arbitrators, UK as well as a mediator of the Malaysian Bar. He is an advocate and solicitor of the High Court of Malaya, High Court of Sabah & Sawarak, the Shariah Court and the Supreme Court of Brunei. Johan lectures part-time in local law schools and has lectured and provided training for the Institute Latihan Kehakiman (ILKAP), Jabatan Kehakiman Syariah Malaysia (JKSM) for both civil courts and Shariah courts judges on Islamic banking. He has trained officers from BNM, local banks and a number of central banks throughout the world. In 2006, he was a visiting scholar to the Asian Law Centre of the University of Washington. He is currently a Shariah consultant to a number of governmental agencies as well as government-funded banks. He was a member of the Board of Studies of the Institute of Islamic Banking and Finance, International Islamic University Malaysia for the 2010-2012 tenure. He was also a member of the Board of Studies of the Faculty of Law of University Malaya for the 2015-2017 tenure. He was in the syllabus endorsement committee in for INCEIF and the CIMA. He is recently accredited as a senior trainer of the IBFIM and a trainer of the Associations of Shariah Advisors (ASAS), Securities Commission (SC), International Council of Islamic Finance Educators (ICIFE) and the Securities Industry Development Corporation (SIDC). He was part of the law reform committee established by the Attorney General office. Johan has authored a number of text books, reference books and articles on Islamic banking published globally. Johan is a member of the Shariah Advisory Council (SAC) of the Association of Islamic Banks Malaysia (AIBIM). He is a consultant to a number of law firms and practices in Malaysia, Brunei, Singapore, Indonesia, the Philippines, and the UK. 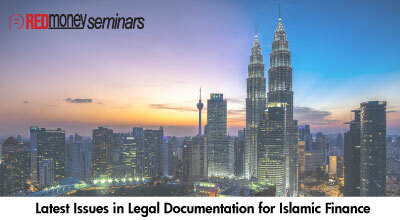 He has drafted and developed numerous Islamic banking legal documents and products in Malaysia and overseas.